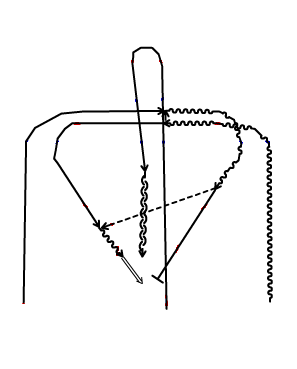 This is a variant of the St. Louis Drill that adds a defender for a 2 on 1. #1 skates up the boards with the puck while #2 skates up the opposite board. In the middle of the court, #1 either passes or makes a drop pass to #2 going the opposite direction. #2 then skates around the cone and back into the offensive zone with #1 on the opposite wing. #2 makes a cross-court pass to #1 and streaks towards the goal. #1 either shoots with a one-timer, takes a wrist shot, or passes back to #2. 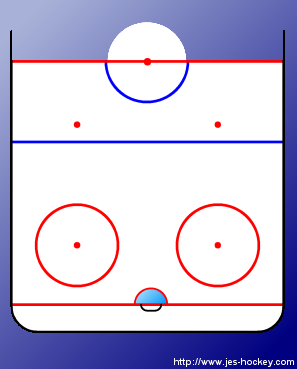 The variant with the defensive player is as follows: As the offensive players begin skating up the boards, the defensive player skates to the centerline and circles around the center dot. The defensive player works to get into position to cover the cross-court pass and subsequent shot by either #1 or #2. Offensive players switch lines and after a few cycles switch the defensive players as well.